Wooster Common School No. 38, Harris County, Texas. The Wooster Common School No. 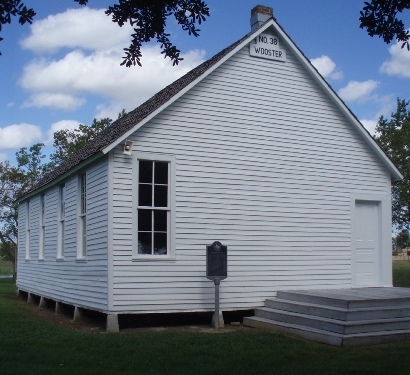 38 is believed to be the oldest existing one-room frame schoolhouse indigenous to Harris county. Planned by Quincy A. Wooster, it was built in 1894 on land donated by Junius Brown. Both Mr. Wooster and Mr. Brown had been prominent citizens from Monona County, Iowa and active with community service and education before coming to Texas. Both had children of school age being taught at home by Mr. Brown�s daughter, Bertha. 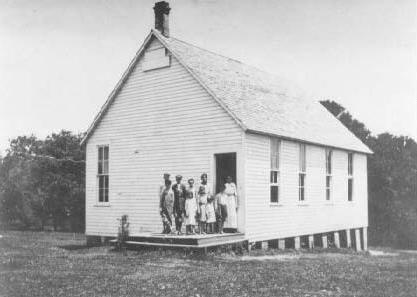 As the community grew the need for a schoolhouse was evident. The principal builders of the new school were family members Bert Brown, Ernest Crow, Steve Steinman, W. A. �Will� Shreckengaust, and John L. Wooster. The little school, though not fancy, was a source of pride for the small community. Cypress was chosen for the frame and exterior siding, and long-leaf heart pine for the interior. When finished the school boasted a real slate blackboard and new desks that had been purchased in Houston and delivered by steamboat to the community that was situated on Scott�s Bay. On April 9, 1895 Commissioners Court instructed School District 17 (White Settlement, Crosby post office) to be divided; Common School District No. 38 to be established, and included the town of Lynchburg between Wooster and the San Jacinto River. The Commissioners Court ordered, on June 13, 1895, an election for �Saturday the 25th day of June at the school house in said district no. thirty-eight. �� Other elections were ordered to elect trustees and to levy taxes. On July 29, 1895 Harris County Department of Education census taker Mr. S.T. Sikes stated "District No. 38. Wooster. This district is in the extreme end of the County, located on a beautiful bay. They have a good frame building and the patrons have voted a local tax for supplementing the State funds, and the school is fairly well equipped with good furniture and apparatus." Intended to education the children in grades one through seven, in the early years the little Wooster school served as a meetinghouse for the community, various social activities, a Sunday School, and a place to vote. Common School District No. 38 operated until it became part of the Goose Creek Independent School District in 1919. When the new David G. Burnet Elementary School opened in 1930 the Wooster school children from first through sixth grades attended. The little school house was closed but reopened in 1937 to house the fifth grade due to overcrowding at the new elementary school. It closed and reopened several times, used as classroom, lunchroom, and music room and for ten years served the Goose Creek District�s Special Education facility. 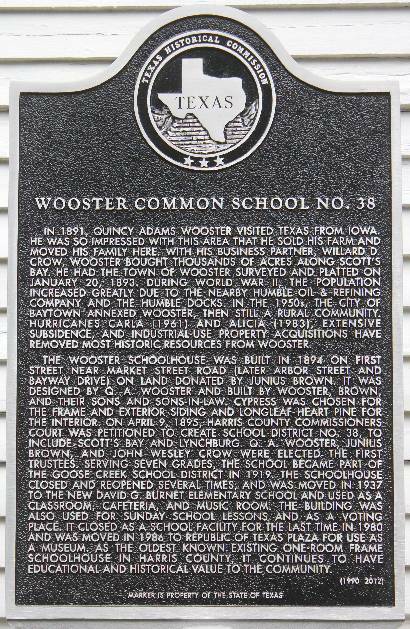 In 1980 the Wooster Schoolhouse was retired permanently. It was acquired and relocated to the Republic of Texas Plaza in 1986, restored and used for tours for school children. In 2006, the building was acquired by the Baytown Historical Preservation Association and is now part of a �living history museum� complex, continuing to be an educational facility for Baytown and its contiguous area.